The WinMan Trails system is just minutes from our Presque Isle and Manitowish Waters Vacation Rental properties. WinMan Trails has 9.2 miles of mountain bike trails that range in difficulty from fit for all riders to expert only! You can mix and match the trails to create loops that are exactly the adventure you’re looking for! If it’s Fat Tire biking you’re looking for in the winter, WinMan has that too. Check this place out for year ‘round biking adventures. The Heart of Vilas County Bike Trail System is an extensive system of bike trails across multiple towns in Vilas County and even into Mercer, Wi which is part of Iron County. Boulder Junction has a huge portion of these trails that are beautiful paved trails that run through the beautiful forest and past all the lakes and streams of the area. 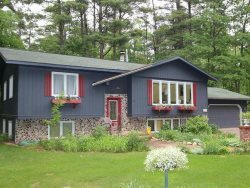 Any of the Boulder Junction or Manitowish Waters vacation rental properties would be perfect for your two wheeled explorations they are located close to this extensive bike trail system. If you’re looking for easy, leisurely bike trails that are about as close to nature as possible, then the North Lakeland Discovery Center Bike Trails are for you! Twelve miles of nice, flat, double track trails are what you will enjoy when you’re biking this trail system. The trails are gentle and wind through the various northland habitats including past Statehouse Lake and the Manitowish River. If you’ve got beginner bikers or kids in tow, this is a great option for you! For even more biking options that you can enjoy while renting a vacation property from Northwoods Home Rentals, check out the Northwoods Trails site. This highlights biking opportunities across the area from road bike routes, mountain biking trails and paved trail options! Get peddling!! Lupine Junefest is a celebration of the soft shades of the lupines and the arrival of the summer season in Mercer, Wisconsin. Early each June in the Northwoods of Wisconsin, the landscape is blanketed in soft shades of white, purple and pink from the lupines that flourish in the area. The arrival of the soft shades of the lupines signals the transition from the Northwoods spring to the highly anticipated summer season. The Lupine Junefest celebration includes 10, 15, 28 and 50 mile Bike tours specifically mapped out for you to enjoy the blooming lupines, breathtaking forest and sparkling lakes & rivers. You can make it a full bike adventure weekend by staying in any of the Manitowish Waters vacation rental properties and biking to and from the Lupine Junefest celebration!